Contrary to popular belief, everything about the National Hockey League and the Boston Bruins did not change the moment Bobby Orr pulled on a uniform in the fall of 1966. It took another year or so for that to happen. As an 18-year-old, Bobby Orr earned top rookie honors in 1966-67. Orr wasn't even a teenager when the Bruins first saw him, a Pee-Wee dominating games against older Bantam players in Parry Sound, Ontario. A small investment to sponsor Orr's team made him the future property of the Bruins, and was probably the best money the franchise ever spent. An 18-year-old defenseman with a crew cut at the start of 1966-67, Orr and rookie coach Harry Sinden weren't able to get Boston into the playoffs for the first time since 1958-59. The Bruins finished last in the NHL's final season as a six-team league, but Orr gave Boston fans hints of all that was to come. His 13-goal, 41-point performance over 61 games (Chicago's Pierre Pilote was the only defenseman with more points that year) was good enough to win the Calder Memorial Trophy as the NHL's Rookie of the Year, plus land him a spot on the league's second team All-Star team. Not everything, however, was positive. Orr suffered a knee injury near the end of his rookie season, and it set off a chain reaction of operations that would not just cut into part of his 1967-68 season, but ultimately cut short his career. Before his knees forced his retirement, however, Orr showed the NHL things it had never seen from a defenseman before. Though not the first defender in league to score points consistently, nobody had ever had the ability to dictate what would happen in a game whenever he had the puck on his stick. Orr was such a tremendous skater that most opponents simply couldn't stay with him. Those who could usually weren't able to control Orr, anyway. He was a brilliant stickhandler, with the balance and strength necessary to out-muscle most of the people who tried to stop him by simply hanging on. Orr played only 46 of Boston's 74 games in 1967-68, but he was still a hands-down choice for the first team All-Star team and the Norris Trophy as the NHL's best defenseman. He'd earn both honors for the next seven years. Orr was named the league's best defenseman eight straight years. The most important thing, however, was that the Bruins got back to the playoffs in '67-68, finishing third of six in the Eastern Conference before a first-round playoff exit. Boston's rise continued in 1968-69, when Orr played and scored more than he ever had before (67 games, 21-43-64) and the B's, off their first 40-win season in history (42-18-16) reached the second round. The true breakthrough season, the one in which Orr graduated from simply a dominant player to the unquestioned best in the game, was 1969-70. Orr became the first defenseman in history to win the NHL scoring title with a 33-goal, 120-point season, the first of six straight years with 100 points or more. He was just as brilliant in the playoffs, going 9-11-20 in 14 games to lead Boston to its first Stanley Cup since 1940-41. Orr won the first of his three Hart Memorial Trophies (NHL Most Valuable Player) that season, and followed it by earning the Conn Smythe Trophy as playoff MVP. Nearly everyone who has followed the Bruins and their history knows about Orr's Cup-winning, overtime goal against St. Louis on May 10, 1970, which a mid-1990s league-wide poll of fans voted the most memorable goal in NHL history. While the goal, and Orr's in-flight celebration at Boston Garden, are justifiably legend, far fewer realize that Orr also scored the Cup-winning goal two years later, against the New York Rangers in Game 6 at Madison Square Garden. Orr, the Hart recipient for the third straight season, also won the Smythe Trophy, after his 24 playoff points included 19 assists -- then a post-season record. Orr won the Hart Trophy as league MVP three times. Raids by the World Hockey Association through the mid-1970s cost the Bruins some top players, but Orr remained at the forefront of one of the NHL's most feared offensive attacks. Though he never matched the 102 assists and 139 points he collected in 1970-71, Orr's most amazing regular season may have been 1974-75, when he scored an incredible 46 goals -- then a record for defenseman -- and led the league with 135 points. Scoring feats aside, Orr was also a top-notch and revolutionary defender who could kill huge chunks of penalty time single-handedly by simply gaining puck control and refusing to relinquish it. Opposing rushers rarely bothered to go 1-on-1 against Orr, who confused them by usually skating forward, not backward, as he moved toward the defensive zone. His superior two-way play, toughness -- Orr, who surpassed 100 penalty minutes five times, wasn't afraid to fight, and was pretty good at it -- and quiet humility made him the most popular Bruin ever. Orr's knees all but quit in 1975-76, when he was limited to just 10 games. 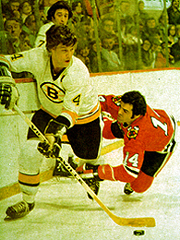 Never informed by his agent that a subsequent contract offer from the Bruins included part ownership of the team, he signed with the Chicago Blackhawks as a free agent in 1976, but his playing career was effectively over. Orr made just 26 appearances in a Chicago uniform over three seasons. Enshrined in the Hockey Hall of Fame in 1979, Orr had several hockey-related jobs outside Boston before returning to his adopted home in the 1980s. A career as a corporate spokesperson led to his current position with Woolf Associates, which represents athletes. Orr was selected as the No. 2 NHL player of all-time -- just behind Wayne Gretzky -- in a 1997 poll conducted by The Hockey News.